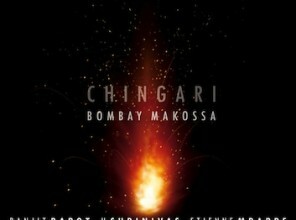 “On their debut album Bombay Makossa – available September 16, 2014 on the Abstract Logix imprint – the three musicians mine their richly divergent experiences to create a dynamic, fluid hybrid sound that fuses the rhythmic intricacy and improvisational fervor of South Indian Carnatic music with the infectious buoyancy of Cameroonian sounds, bridged by a shared love of jazz, second-line funk, and the shimmering textures and grooves of modern pop. “I heard Shrinivas,” Barot continues, “as narrative vessel from India who would ‘answer’ Etienne, so to speak, through his own unique mode of expression.” Before his tenth birthday, U. Shrinivas was already impressing audiences with his uncanny ability to adapt the mandolin to the demanding rigors of traditional South Indian music. While keeping his roots in the Carnatic tradition, Shrinivas has sought a wide range of outlets for the ecstatic, almost vocal quality of his playing. George Harrison numbered among his fans, and he has been featured as a member of Remember Shakti, alongside guitarist John McLaughlin and Zakkir Hussain. Wielding a six-string electric instrument, his performances on Bombay Makossa make full use of his formidable technique, resourcefulness, and willingness to probe boundaries and explore new territory. Bassist Mbappe is no stranger to complexity, having played a pivotal role in legendary fusion guitarist John McLaughin’s kaleidoscopic 4th Dimension quartet since 2009. Mbappe’s gift for tackling the most challenging rhythmic structures with ease and fluency first won the Cameroon-born and Paris-based musician membership in the bands of Salif Keita and Manu Dibango. Now, in addition to performing with the 4th Dimension, he can be heard in the all-star fusion group the Ringers with Jimmy Herring and Wayne Krantz, as a solo artist, and with the multi-faceted Su La Také. As producer and composer, Barot faced the daunting task of reconciling each member’s respective musical style and forging a coherent, compelling new sonic identity. Such eclectic undertakings are not unfamiliar to Barot however, as his distinguished career has found him excelling in as a composer Bollywood’s competitive film scene and as a distinctive drummer more western-influenced contexts. The son of Sitara Devi, India’s famous traditional Indian dancer, Barot is also steeped in Indian traditions, as demonstrated by his mastery of konnakol– the Carnatic tradition of spoken percussion syllables, which he demonstrates on Bombay Makossa.